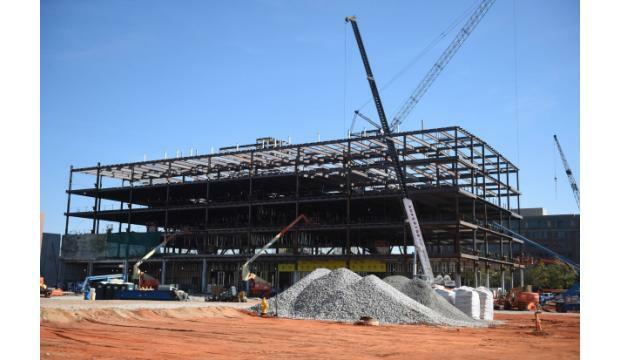 Local and state officials Thursday ceremonially “topped out” the steel frame of a $60 million cybersecurity training center scheduled to open next July. Workers on the Hull McKnight Georgia Cyber Innovation and Training Center actually put the final steel beam in place, on the highest point of the mid-rise building, Nov. 10. But Thursday’s gathering more formally recognized the progress of the facility, including a barbecue lunch to thank the project’s work crews. For weeks before the topping-out, project partners and the local community were invited to sign the final beam for posterity. The beam features more than 150 signatures. A crane raised an American flag and a Georgia state flag at the building site Thursday, both of which were flown over the State Capitol on Oct. 1, the first day of National Cyber Security Awareness Month. The GTA is overseeing construction and operation of the 167,000-square-foot center. It describes the center as the nation’s single largest investment in a cybersecurity facility to date. The education and training center will prepare professionals to protect the nation from cybersecurity threats. The center is aligned with Augusta University’s Cyber Institute and AU’s recently launched School of Computer and Cyber Sciences. The center will anchor AU’s Riverfront Campus. The center also will house an incubator for startup cybersecurity companies and the Georgia Bureau of Investigation’s new cybercrime unit. Jones Lang LaSalle is the construction project manager and is providing leasing information for the center. M. Arthur Gensler Jr. and Associates Inc. is the architect. New South Construction is the general contractor. Cranston Engineering Group is handling the engineering work.